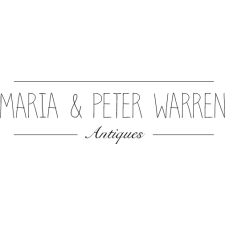 It was in 1982 that my parents opened the business, Maria and Peter Warren Antiques. They were a globe-trotting couple and enjoyed the arts in all forms which is what drew them to this business, to begin with; so when my father retired from PepsiCo International it wasn’t a stretch to imagine that they would join their many friends in the antique world as dealers. I hope that I can bring one-tenth of what my father and mother brought to the business if I've done that, then I will have done them proud. We don’t have a store right now instead we are preferring to doing a great many shows. We’ll publish the shows as we go and hope you’ll be able to visit us along the way and then stick around and talk a while, we'll enjoy catching up or meeting you and finding out what you love about antiques and what you might be looking for.